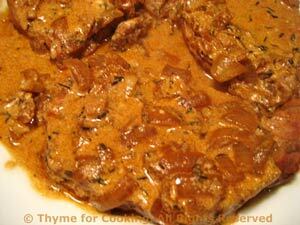 Hungarian Pork Chops, Thyme for Cooking easy main courses. Quickly browned, then simmered in white wine and stock, flavored with bay and paprika, these pork chops are fork tender and full of flavor. Roughly chop onion and mince garlic. Heat 2 tsp oil in nonstick skillet over medium heat. Add pork chops and brown well on both sides, about 8 minutes, total. Add remaining oil and paprika and sauté 1 minute. Add onions and garlic and sauté until tender, about 5 minutes. Add remaining ingredients, except yogurt, to skillet and heat to boiling. Return chops to pan, reduce heat, cover and simmer 20 minutes. Uncover, increase heat and reduce pan juices to about 1/3 cup. Remove chops and put on a small platter. Stir yogurt into pan juices and pour over chops. Serve.